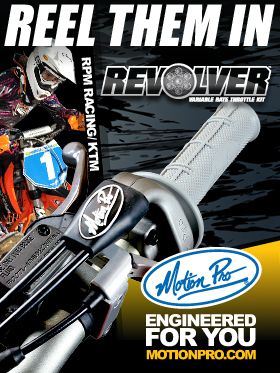 Race Tech’s latest Gold Valve Kit is for the steering damper found on the 2008-09 Honda CRF450R’s. The standard mounting configuration makes the stock damping inadequate. The CMGV 2001 Gold Valve Kit comes with a Gold Valve, Ultra-low friction piston band and instructions for 3 damping options: soft, standard and hard. 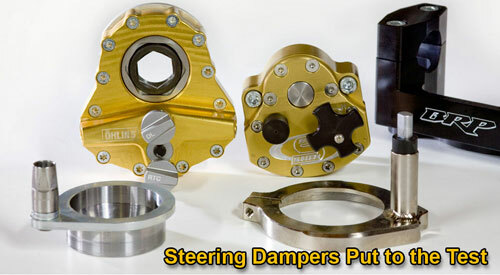 Race Tech also offers a rebuild service for the Gold Valve Steering Damper and for the standard OEM steering damper. The Gold Valve Steering Damper Kit (CMGV 2001) is available from Race Tech and retails for $99.99. The Gold Valve rebuild service is available for $19.99 and the OEM re-valve service is $34.99. All Race Tech products, tools and services are available by calling Customer Service (951) 279-6655 or please email: sales@ racetech.com.